Another library gem found on the new acquisitions shelf! This book was perfect for us because we just planted a tree in our front yard a few weeks ago... it only took us 5 years to decide on what we wanted. Hah! Can you tell my grandfather's farmer genes didn't get passed down? Hey... a tree is a big commitment. It's not a little bush you can dig out if you change your mind. I felt serious pressure here! Anyway... I think it's interesting that Arbor Day is in April since all of the information we collected (over the past 5 years) said that it was better to plant a tree in the fall. Something about the the leaves going dormant means that the tree only has to deal with the stress of growing roots, not roots and leaves. Maybe it's one of those things that you can bend the rules on. What was I talking about? Oh yeah... the book! 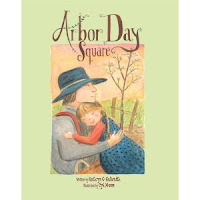 This is a sweet little book and a wonderful way to introduce your children to Arbor Day. The illustrations are very pretty and delicate and are reminiscent of the beloved Garth Williams Little House drawings. There is a pioneer connection so it would work well with a unit study or a history study of the time period. The inhabitants of Katie's prairie town pool their money and plant 15 trees in their new town square. It becomes a tradition that Katie eventually introduces her daughter to as they picnic underneath the flowering dogwood Katie first planted in memory of her mama. Two years ago, in the fall, we planted a red drummond maple. What kind did you plant? We chose an Autumn Blaze Maple! It's supposed to be a fast grower with lots of pretty fall color.